Clubfoot is a common condition affecting about one out of every 1,000 newborns in the United States. Children with this foot condition are born with one or both of their feet twisted or bent. This congenital problem requires immediate and long-term treatment to prevent serious problems from arising for the child as he or she grows older. The primary symptom of clubfoot is the positioning of the affected foot. For instance, the foot itself may be smaller, turned sideways, turned inside, turned down, or otherwise be positioned differently from the other foot. Sometimes, clubfoot can affect both feet. This condition initially causes no pain, but can become more painful over time. However, over time, the affected leg may end up shorter than the other, making it more difficult for the child to walk, run, and participate in regular activities. While clubfoot is occasionally diagnosed through pre-natal ultrasound, it is most often diagnosed after birth based upon the positioning of the foot and by how much the child can move the foot and the legs. Imaging tests such as X-rays are not usually necessary for diagnosis and may not provide a clear image of the bones because of the structural make up of the infant’s bones. The preferable method for treating a club foot is to simply move it back into a normal position. This method is often possible when the foot has been bent because of how the baby was growing in the womb and also retains its flexibility despite having been bent. 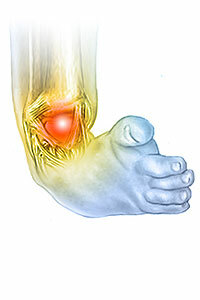 When the muscles are too rigid for the foot to be moved back right away, other treatment becomes necessary. This treatment, when begun early enough after birth, is often effective in returning the foot to a normal position and enabling the child to walk, run, and play. These treatments include setting the foot in a slightly more normal position and securing it in a cast. The foot is checked, adjusted slightly further, and re-casted every 1 to 2 weeks for up to four months. After four months, children who have made enough progress only need the foot splinted in order to keep the foot in the proper position.If the foot does not improve enough with this process, doctors may choose to operate on the foot to return it to the normal position. There are two methods for correcting a club foot that utilize this process but slightly differently from each other. The traditional method adjusts one problem with the foot (the inward bent of the foot) first, followed by the direction (up or down) of the foot. The Ponseti method, instead, treats both problems with the foot at once. This method is effective for 90 percent of patients, and requires only minor surgery if the clubfoot remains after the initial four-month period. The traditional method, on the other hand, requires major surgery if the treatment does not work sufficiently.